RazorSQL is a GUI tool for working with Postgresql. First, create the razorsql directory. Download RazorSQL into the ~/Downloads/navicat directory. Open a web browser to http://www.razorsql.com/download_linux.html. Click Download next to Linux (64-bit). After the download completes, open a command prompt and enter the following commands. I have assumed that you downloaded the .zip file to the Downloads/razorsql directory. The following steps are performed in the RazorSQL GUI. 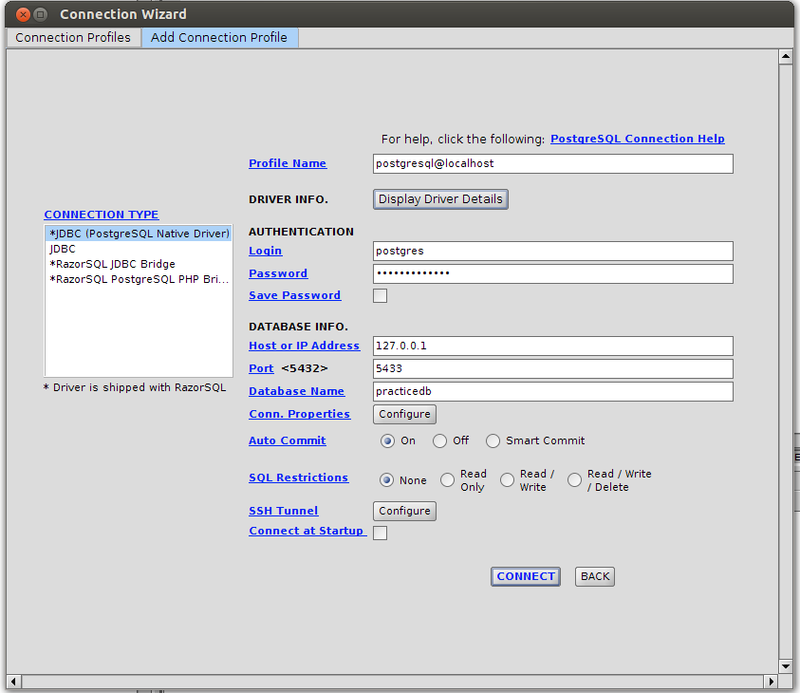 From the menu, select Connections, click Add Connection Profil. 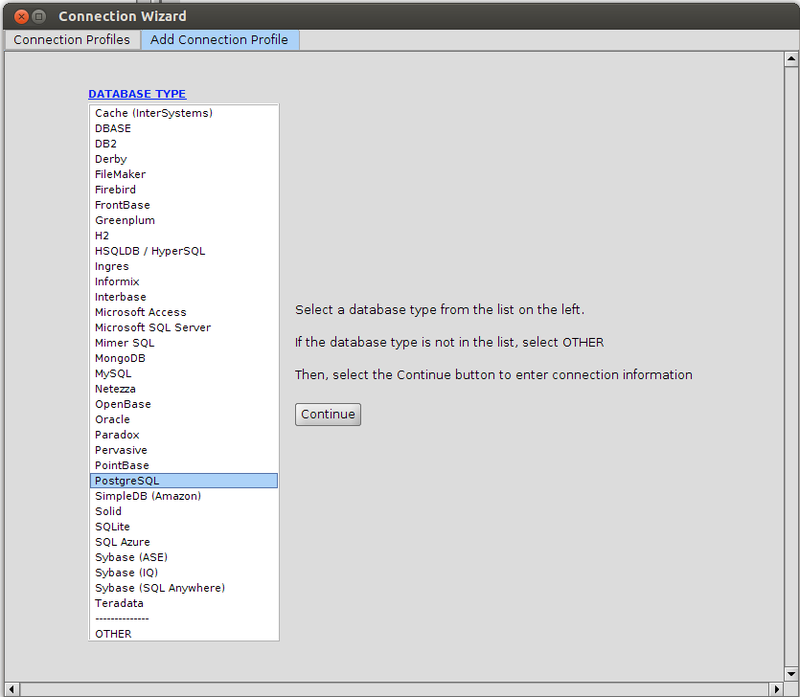 In the Connection Wizard, select Postgresql, click Continue. In the 2nd screen, enter the information shown below. The default installation of Postgresql does not allow TCP/IP connections, which also means JDBC connections wont’ work. Let’s make a backup of the original config file. You will also need to update the firewall to allow connections to this machine. After installing Postgresql on Ubuntu, you will need to complete a few basic setup steps. The first step is to update the password for the postgres user. Then enter the following command at the postgres=# prompt. If you exited the postgres=# prompt, then enter the following command to connect to Postgresql. However, if your prompt still looks like postgres=#, then do not enter the psql command below. Enter the following command at the postgres=# prompt. First we’ll list all of the databases, which should be the following: postgres, template0, and template1. Now you should see the practicedb database. Press Ctrl + D to exit the Postgres prompt. I was going through my old notes as I’m cleaning our my closet. I came across the following notes, that I like a lot, on how to write a professional email. Use email macros to both improve your efficiency in replying to email, and to improve quality. End each sentence with the correct punctuation. Each sentence should discuss only one topic. Use bulleted lists to simplify that information you are trying to convey. Bulleted lists are easy to read. Each point is separated from other points. Lists help to organize thoughts. Do not use SMS fake words – ur, dk, lol, how ru, etc. Limit the email to the subject matter described in the Subject. Attach files before writing the email. No body likes a forgotten attachments. There are more, but I would put these as my top 10 list.